For my family and I, this past weekend - Memorial Weekend 2008 - was spent at Greenfield Village. And what a time we had! It was the Civil War Remembrance Weekend, and nearly 500 of us reenactors spent the entire weekend wearing period clothing and giving the record-breaking crowd a taste of what life was like during those four years in the early 1860's, camped out in canvas tents, cooking our food over an open fire, and emulating the life of our ancestors. 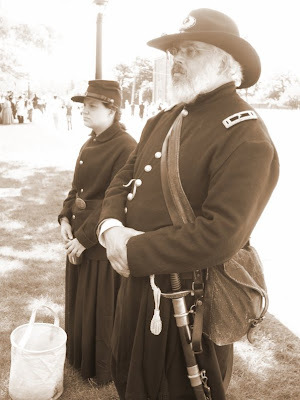 The president of our Civil War unit, Mike Gillett, loves to use the the term "The Best Ever" at every event. Like me, he cannot wait to don period clothing and head out to an event. Heck, he and I would be satisfied wearing 1860's clothing and sitting in our own back yards! This here is a photo of Mike and our unit watergirl, Emily. Anyhow, this past weekend at the Village truly was The Best Ever. Everything just seemed to fall into place, especially the weather. 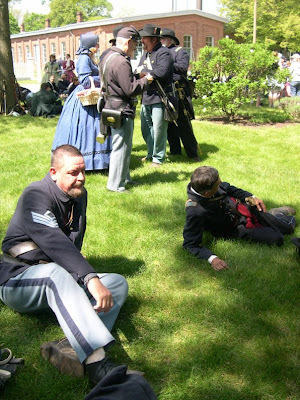 But, seeing all of our reenactor friends - not just from our own unit, but from the many other units who participated - is like a reunion of sorts. We're all one big happy family and the hugs and greetings abounded throughout the weekend. And not once did any of my kids even hint at missing the television, radio, video games, or any other modern electronic devices. So, why was this particular event better than all the rest? I can't just pick one instance. It just seemed that all factors fell into place. 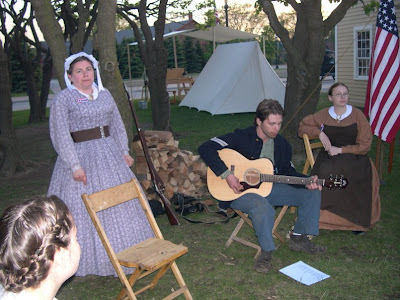 Saturday evening, my oldest son played his (modern looking) guitar, performing the great period tunes of the time: Hard Times Come Again No More, Just Before the Battle Mother, Wayfaring Stranger, Goober Peas...much to the delight of not only members of our own unit, but other unit members stopped to listen as well. Walking among the historic structures (unfortunately, walking on very modern cement! ), helped to give one that feeling of stepping into the past. 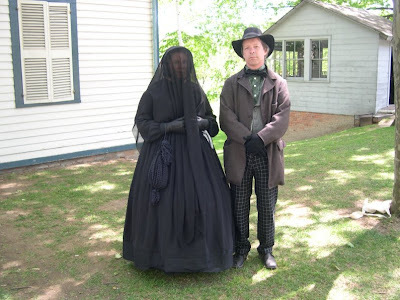 I especially enjoyed the mourning presentation at the Adams House. 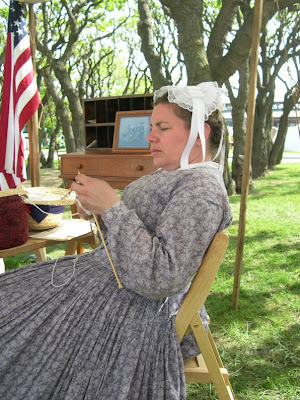 As the only postmaster in the reenacting community, I enjoyed receiving and delivering mail. Of course, the civilians had to come to me to get their mail, but I did deliver (with the help of the Good Chaplain) mail and packages to the troops. Feedback tells me that, for those who received mail, it was a great success. I guess my finest compliment came from Beth Turza, who told me that I was helping to make us all more of a community and was bringing all of the different units together. I also had a great time working with another group I belong to, the Michigan Soldiers Aid Society (MSAS), a civilian-only unit made up of a few men and many women. They are sticklers for accuracy in virtually everything 1860's, which is one of the reasons why I joined their organization - they know their stuff! At the Village, we put on a scenario where Reb prisoners were being brought in to the Smith Creek Depot by train to then be transfered to a northern prison camp. The lone guy with the women of the MSAS - yup! That's me! The Memorial Day/Decoration Day service on Monday was as touching as any I have ever been a part of. 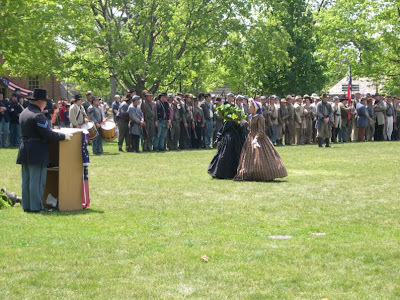 It included the laying of the wreaths by women dressed for mourning. The day - this weekend - means more than the barbecues and cottage openings. And it's this sort of service that brings it all home. It is truly a day to remember those who have fought for our country - yes, I thought of my father, who fought in WWII, and who passed away at the much-too-young age of 55. Here is a photo of him taken back in 1945. 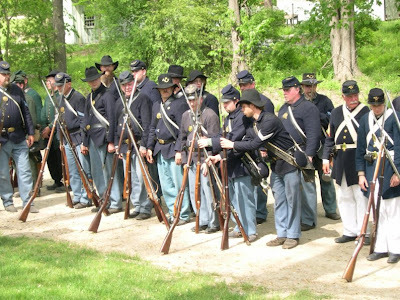 Civil War reenacting has become a lifestyle - a passion - almost an obsession - and I am very proud to play a role in this hobby. The Oakland Press, in the May 29th issue, says it best: "More interactive than a book and more accurate than many movies, reenactments allow visitors to not just glimpse history, but to step back and experience a moment in time." By the way, welcome to the newest 21st Michigan members: The Keeney Family, Mark Bonekowski, Tommy Spanski, and Lynne Dunn. This was their first real reenactment - hope you all liked it!! Ken... this WAS the best event ever. It was a terrific time. 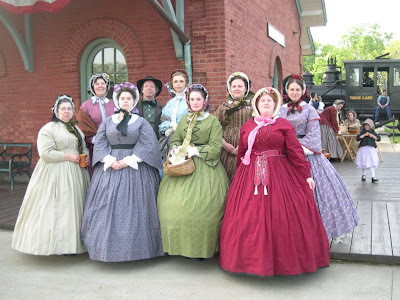 We are much blessed here is Southeast Michigan to have such a large and active reenacting community - family - and to have such venues like Greenfield Village, Jackson, Waterloo Farms, Wolcott Mill... and on and on!